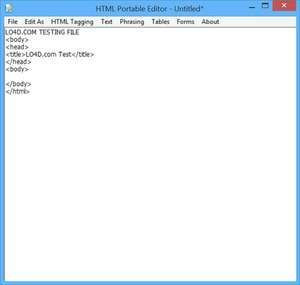 HTML Editor Portable is a lightweight HTML editor application which is suitable for basic editing of HTML documents. As a portable application, HTML Editor Portable does not require installation but if you're running a modern version of Windows, you will have to run the application as administrator. This can be annoying. The main interface of HTML Editor Portable is rather plain and isn't too dissimilar from Notepad. For security reasons, you should also check out the HTML Portable Editor download at LO4D.com which includes virus and malware tests. Additional screenshots of this application download may be available, too.